How can I tell if I’m a good swimmer? Or should we call this: how can I tell if I’m a fast swimmer? Every athlete likes to compare them-self to others, either in real competitions, or against standard times or tests. The Cooper 12 minute swim allows you to compare your aerobic capacity to others by age group. 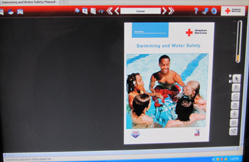 I usually have a copy in class for my students to look at, or go to the library for a copy of the really great The American Red Cross Swimming and Water Safety Manual OR download the book for free. Our pool is 25 yards wide, so if you swam 20 laps it would be 500 yards. 500 yards of freestyle in 12 minutes would be an excellent rating on the Cooper scale for a 60 or more year old man or a 40-49 year old woman. It would rate good for a 40-49 year old man or a 20-29 year old woman. It would rate fair for a 20-29 year old man or a 13-19 year old woman. It would rate poor for a 13-19 year old male. 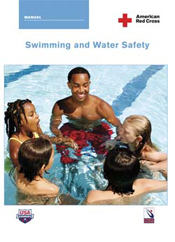 (This had no index, so I wrote one: Swimming and Water Safety 2009 index ). For a more challenging test, consider the Navy Seals candidate’s swim test of 500 yards breast- or sidestroke in less than 12 minutes, 30 seconds. Run 1.5 miles in 11 minutes, 30 seconds (wearing boots). The Red Cross used to have a pre-test for lifeguards of treading water for two minutes with your fingers in your armpits. A letter to participants in an “Escape from Alcatraz” 1-1/2 mile ocean swim said “if your time for a mile in a pool is slower than 40 minutes, we do not recommend you attempt this swim.” The De Anza pool is 25 yards wide, so 70.4 laps (one width being one lap) would be a mile. We volunteer as lifeguards at these races and you might want to read advice for lifeguards (and athletes) at open water swims at Escape from Alcatraz ‘Sharkfest’ swim volunteering. A six and a half mile ocean swim race I volunteered at had a cut-off time of 4 hours, 20 minutes. A Samurai was able to swim almost 75 yards underwater on one breath. Look at the National Senior Games website for minimum performance standards for competitors. From the Official Sports Rules Book 2017. Other competitions include 50 and 100 yard butterfly, 100, 200 and 500 yard freestyle, 50,100 and 200 yard backstroke, 50, 100 and 200 yard breaststroke, and 100 and 200 yard individual medley. Most places you might apply to for a lifeguard job will not have any swim test. New York city required all guards be able to swim “50 yards in 35 seconds with proper form.” Pool guards also needed to swim 440 yards in 7 minutes, 40 seconds and beach guards in 6 minutes, 40 seconds. The beach guards also needed to complete a 300 yard ocean swim. An ocean lifeguard pretest consisted of a 1 mile beach run within 8 minutes followed immediately by a quarter mile (just under 400 meters) ocean swim within 8 minutes. Another ocean lifeguard test asked for a 500 meter ocean swim in 10 minutes or less. To work on a beach in Maine, lifeguards must be able to swim 500 yards in 10 minutes and run 1 1/2 miles in 12 minutes. Most crossings of the diagonal longest length of Lake Tahoe, about 21 to 22 miles, (6,225 feet altitude), take from a little over 10 hours to almost 21 hours. Are animals faster swimmers than you? Umbra, a formerly stray dog, swam a mile in 28.5 minutes and completed a Masters lake swim in Chicago of 3.1 miles in 77 minutes. Olympic swimmers have been clocked at top speeds of just over 4 mph. Tuna can hit 62 mph. They can swim at 9 mph for an indefinite time. Elephants can swim 20 miles or more per day. They use their trunks as snorkels. Dolphins swim at 40 knots and up (about 45 miles per hour). Generally sharks swim at speeds less than 5 kph (about 3 mph). For the most part, bottom-dwelling sharks are slow-swimming. Makos are among the fastest sharks, reaching speeds up to 48 kph (30 mph). A polar bear’s front paws propel them through the water dog-paddle style. The hind feet and legs are held flat and are used as rudders. “Harbor seals swim with all four flippers: their hind flippers propel them forward, and their foreflippers help them steer. Harbor seals can swim forward and upside-down. They rarely swim backward. Two thirds of drowning victims are good swimmers. Why you should wear a lifejacket. Links to current rules and regulations for swimming, water polo and triathlons are at: Swim classes FAQs . The De Anza pool is 25 yards wide, so 20 laps (one width being one lap) would be 500 yards.